Dr. Neil Hoffman honored with special service award. 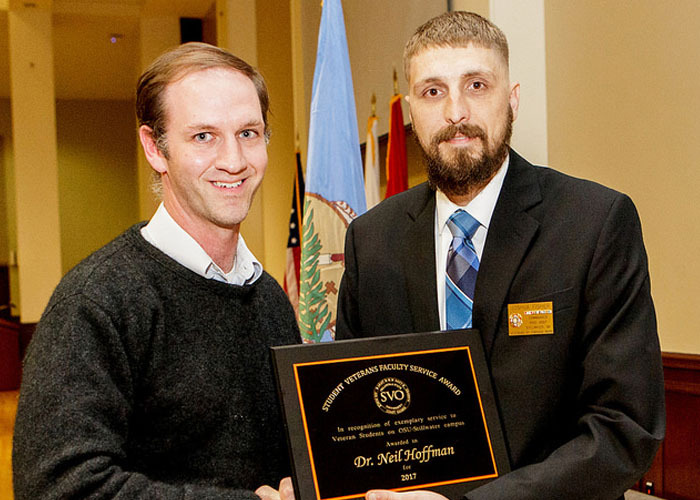 The Oklahoma State University Student Veterans Organization recently honored Ms. Ruthie Loffi and Dr. Neil Hoffman with special service awards recognizing exceptional assistance to student veterans in their educational pursuits this year. In addition, the Office of Veteran Student Academic Services at OSU recognized Dr. Jason F. Kirksey for his support and advocacy of veterans. “The academic success of veterans on campus is only possible with the help of faculty and staff,” said Joshua Fisher, president, OSU Student Veterans Organization, who presented the awards. Ruthie Loffi, administrative assistant in the Department of Leadership and Campus Life at OSU, was honored with the Staff Member of the Year award for helping a student veteran get the health services he needed and being instrumental in assisting the OSU Student Veterans Organization send some of its officers to a national conference scheduled for January. Dr. Neil Hoffman, assistant professor of mathematics, received the Faculty Member of the Year award for ensuring a student who was deployed with the National Guard, in the aftermath of Hurricane Harvey, was able to remain current on her course work. Hoffman’s efforts allowed her to avoid withdrawing from the course, which would have extended her time at OSU for an additional year. Dr. Jason Kirksey, vice president for institutional diversity and chief diversity officer at OSU, was the first to be awarded the OSU Veterans Campus Champion Award for his work to advocate for stronger programs and additional resources for veterans on campus. Thanks to support from Kirksey’s office, veterans and active duty military members are no longer required to pay a fee when applying to OSU, and the Veteran’s Appreciation Scholarship award was increased from $1,500 to $3,000 per recipient. The award was presented by Amy. The Student Veterans Organization at OSU is a group which assists all veterans on campus in the transition and successful completion of a degree, including reserves, national guard and family members. Our goal is to help veterans get connected with companies and gain all the tools necessary to be the best asset to their future employer. Individual members also strive to be leaders in our community through community service. The primary task of the Veteran Student Academic Services office at OSU is to coordinate with campus, community, state and federal organizations to provide services to more than 850 veterans and military-affiliated students in Stillwater. The office is also in charge of the Veterans Success Center on campus, which offers veteran students a place to study, interact and seek academic assistance in transitioning to college life. For more information, contact Rick Hansen by emailing richard.hansen@okstate.edu or calling (405) 744-1390.